Tropical Vacation Destinations in Australia - Honeymoon Destinations. 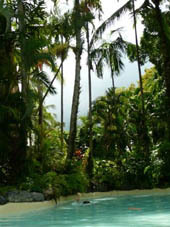 Tropical vacation destinations in Australia are safe, warm and relaxing, with a touch of luxury. Tropical vacation destinations in Australia can be anything that you want, but, in general, you can be assured of safety, warmth and relaxation for a start. So if you have decided to travel to Australia and like the idea of exploring the tropics you can choose from family travel destinations or even top honeymoon destinations for an enjoyable and memorable experience. You will, of course. have obtained an Australia travel visa and booked your flights. After that it's up to you. Are you just looking for a restful time, lazing around the pool in the daytime then enjoying a variety of fine dining experiences during the evenings? Or are you ready for more adventurous pursuits? This website is about the art of tropical Australia and I thought that you might like to come and experience that for yourself. Artquest Port Douglas runs small tours of artists' studios and also arranges interesting art related workshops in the Port Douglas area for small pre-arranged groups. Tropical vacation destinations don't always present such an opportunity, so if you are a group of art lovers, make the most of it! Tours can be tailored to suit the interests of each group so that, for example, if you wish to spend the whole day learning to make glass jewellery or paint landscapes in the mountains, that can probably be arranged. As well as more cultural pursuits, many North Queensland tropical vacation destinations offer you a range of experiences, from diving on the Great Barrier Reef, white water rafting, hot air ballooning to jungle "surfing" in the tree canopy. The area is scenically beautiful so don't forget your camera (or sketch book)! Winter is the time to see the beautiful humpback and minke whales that migrate north from the icy Southern Ocean to mate or to give birth in the protected waters of the Great Barrier Reef. Tours have been especially developed to observe these impressive and gentle creatures. 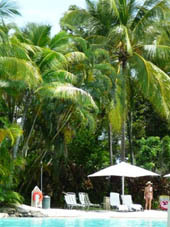 Port Douglas Resorts - so many choices! There is a variety of accommodation from which to choose - comfortable backpacker rooms, a spacious pole home for families or groups, bed-and-breakfast for couples or singles, top-notch resort accommodation, farm-stays - or camping for cheap tropical vacations , if that is your choice. Self-catering resorts and luxurious holiday homes are amongst the most popular types of accommodation and these are usually situated on a bus route or within walking distance of shopping - another great draw-card for your Australian tropical vacation destinations. Looking for special interest station stays, farmhost, bird watching, whale watching or other tailor-made accommodation? 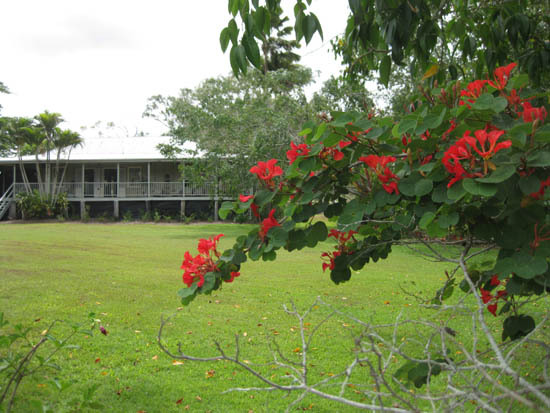 Would you like to stay on a tropical fruit farm, a sheep or cattle station or with hosts who are knowlegeable in your special interest area, perhaps bird watching, bush tucker or fishing? If you spend a little time researching you are bound to find holiday stays that are just perfect for you. Luxury mountain retreats, working cattle stations, fishing lodges and bird watching hideaways in North Queensland all offer 'hands on' experiences that you have only dreamed of. Before we came to live in North Queensland, my family and I enjoyed several holidays here. See this map of Northern Australia. One year we towed a boat all the way from Perth in Western Australia and back - a distance of more than 6,000 kilometres. On other occasions we pulled a "pop-top" caravan behind us, so, like a turtle, our house was always with us. If you would like to share your tropical vacation destinations experiences, please scroll to the bottom of this page and join in! What's on your list of tropical vacation destinations? Beaches? The hinterland? Australian beaches are renowned for their sparkling white or golden sands and clear, turquoise water but North Queensland has a few hazards with which to contend. Because of tidal rivers, the ocean close to shore is not always clear - in fact it is often quite "murky". Dangerous marine "stingers" as well as crocodiles frequent mangrove creeks along the coastline. During the summer months, which is the stinger season, swimming is best done at various locations on the reef, including romantic islands , in clear fresh-water creeks ...or your resort's swimming pool! Inland from the coast, up and over the mountains is the area known as the Tablelands. Here fertile and productive rich volcanic soils stretch in a patchwork of various food crops as far as the eye can see. Heading north towards Cooktown the sealed road winds through savannah and over mighty rivers - which seem to turn their backs on the nearby Coral Sea to flow in the 'wrong' direction. Perhaps you can find out why? The Australian climate could be summarised as being one of extremes - very hot, humid, wet summers in the north, the inland a desert, blazing hot in summer and freezing cold in winter, sometimes carpeted with a profusion of wildflowers. This vast land is intersected with huge, seasonal rivers and lakes, mountain ranges and flat flood plains. It is home to prolific bird life and a sparse, often isolated, human population. "Down south" are the more temperate regions, which enjoy what one might describe as a Mediterranean climate, with pleasantly hot, dry summers and cold, wet winters. This is where most of the Australian population lives, clustered around the capital cities of Brisbane, Sydney, Melbourne, Adelaide and Perth. Australians, from many different ethnic origins, mostly live near the coast. Their cousins from "the bush" are a resilient lot, wresting a living from the land in sometimes difficult conditions of drought or flood - and occasional abundance. 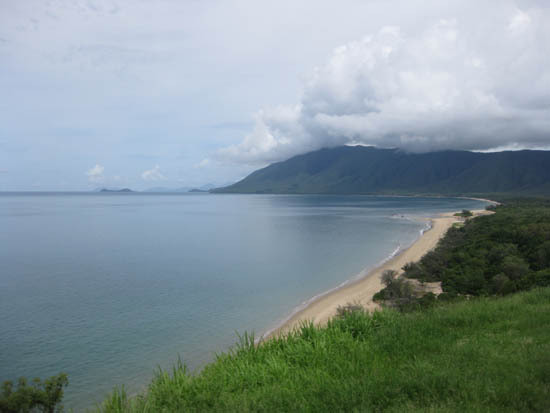 Here in North Queensland you can expect hot, wet summers (November - April) with daily temperatures ranging from a minimum of about 20 degrees C to perhaps 33 degrees C on a day when it doesn't rain. The rain cools things off, of course. Most people don't worry too much about getting wet - they soon dry out! Winters (May - October) are pleasantly warm, with daily temperature variations between about 16 degrees C and 26 degrees C.
Clothing - casual and coolly comfortable (cotton is best) with a wrap or jumper for cooler nights. If you would like to know what the weather is doing today, check it out here. Whether you would like your tropical vacation destinations to be mostly for rest and recuperation or exciting adventures, filled with new experiences, there is sure to be a choice that will keep you going until the next one! 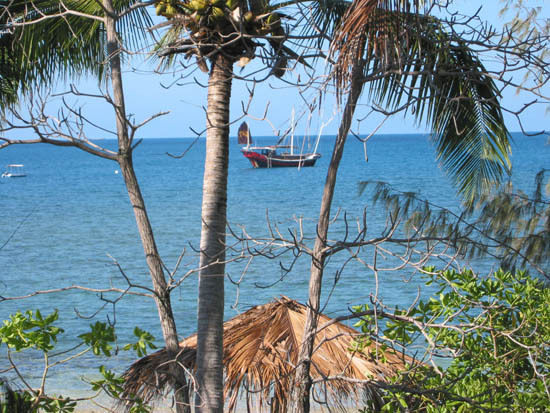 Do you have a great story about your tropical vacations? Perhaps you would like to share your funniest holiday experience, or the strangest or just the absolute BEST? We would love to hear it! Please write at least 300 words about your experience and upload up to four photos.